Giant hogweed in the news! Last week I helped to confirm the ID of Virginia's first population of giant hogweed (Heracleum mantegazzianum) in Clarke County. The Facebook post about it has exploded and made its way all over the internet! We were a small part of the team that identified it--the landowner's report was made to their local master gardener's chapter and the local extension agent. They reported the sighting to VT's Weed Clinic, who asked for my help in ID'ing the plants. Confirmation was also made by botanists at the UNC herbarium, Derick Poindexter and Dr. Alan Weakley. If you think you have giant hogweed on your property there is actually a good chance that you have the more widespread, native plant cow parsnip (Heracleum maximum). It can still cause a rash but not as severe as giant hogweed. Check this ID guide to see if your plant might be giant hogweed. 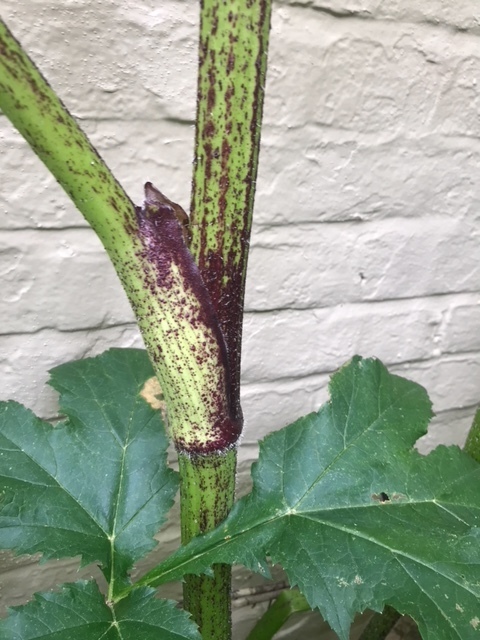 If you still think you have giant hogweed, take detailed photographs and contact your local extension agent or the Virginia Dept. of Agriculture and Consumer Affairs. Please visit this VT News media advisory for details, quotes, and video of me discussing this development! We enjoyed our last Herbarium tea of 2017 this past Friday. Our theme was holiday plants so we had specimens and displays of notable holiday plants like poinsettias, holly, and mistletoe! I was surprised to learn that mistletoe is quite rare in the area with only one known population in the Montgomery & Giles Counties area. My highlight of the event was hearing faculty and students connect with each other for the first time and discover ways they could collaborate or help each other! We also featured Christmas tree ID! Fall foliage at the Science Festival! 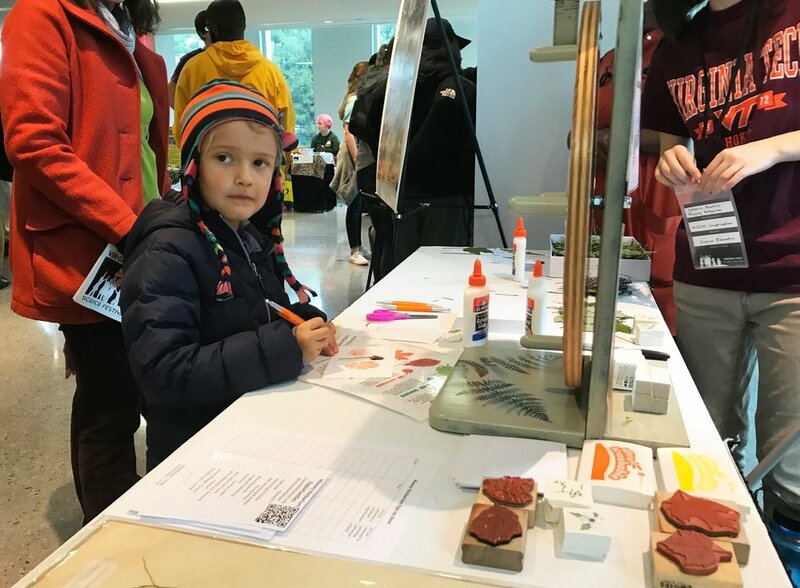 We participated in the VT Science Festival on Saturday, Nov. 4 and talked botany with some of the over 5,000 attendees! Our table featured three activities. The Wheel of Destiny had a fall foliage theme and taught players the major pigments responsible for our colorful autumn leaf displays. We also had a make-your-own-specimen station for kids to make their very own museum specimen to take home! These pint-sized versions included leaf or flower samples and ID labels for kids to arrange and glue down. And don't forget the Selfie Frame! It got a lot of use throughout the day by attendees both young and old. A full house at our specimen transcription day! We had a full house with 15 volunteers at the Massey Herbarium's first specimen transcription event last Friday. Our event was part of the four-day global WeDigBio initiative. By transcribing specimen labels from photographs, volunteers can unlock these data and make them available for anyone to use online. Volunteers at universities and museums on four continents combined to transcribe over 19,000 specimens during the event. Brian and Rebecca celebrate finding the oldest specimen of the day (1891). Our volunteers contributed over 550 of those specimen transcriptions. We had a diverse pool of volunteers, with many Master Naturalists attending. Virginia Tech undergrads arrived in force too, with many Natural History Collections Club members and two students from the Corps of Cadets. Virginia Tech staff were represented by the University Library's Biological Sciences Liaison Ginny Pannabecker. Some of the highlights on the day included finding several specimens from the 1800s, including one sheet from 1891! Our funniest locality was definitely the flower from "Lick Skillet!" We finished the event with our second Herbarium Tea. Volunteers and other Biological Sciences members enjoyed tea, coffee, and baked goods while we celebrated our progress. Want to help out too? Visit our expedition here and start transcribing! Drs. Martha Muñoz, Ginny Pannabecker, and Jim Tokuhisa engaged in discussion during the tea. Tom Wieboldt leading a tour for a cadet. Undergrads help handle our specimen backlog! Yesterday we had thirteen VT students from the Natural History Collections Club attend a work night at the Massey Herbarium! The students helped with mounting specimens from our backlog and preparing material for mini-specimens for an outreach event. After pizza of course! Students prepared hundreds of samples for mini-specimens! These will be used in a hands-on activity at the VT Science Festival. And we set up an assembly line for mounting plant specimens for our collection! Some of the finished products! The mounted specimens are ready to be databased, imaged, and filed. The boxes of flowers are ready for kids to make their own mini-specimens! Plant pressing, hot tea, and good times at the first herbarium tea! The Massey Herbarium hosted its first herbarium tea last Friday! 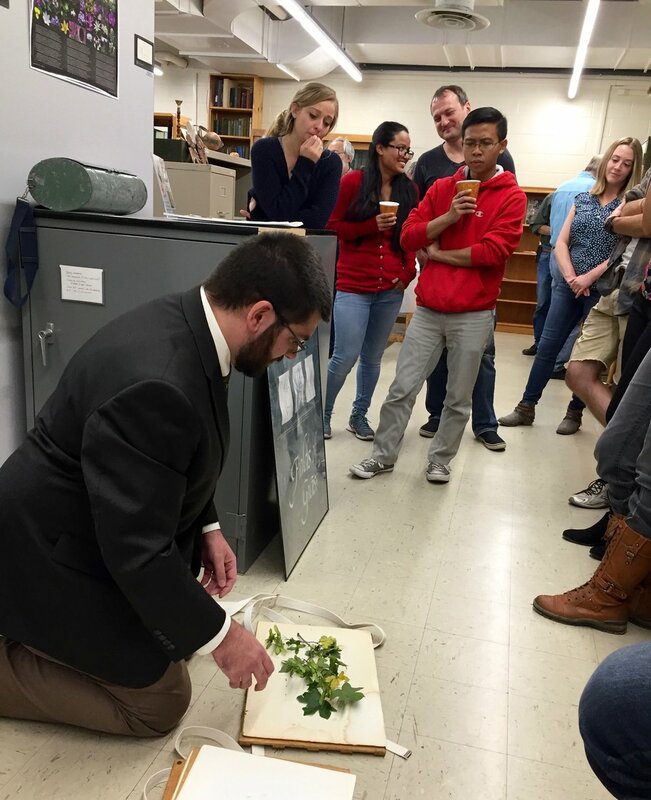 Over 50 people from several departments attended and enjoyed tea, coffee, cake, and a plant pressing demonstration. Attendees were given a tour of the collection and a chance to see some of our more unusual specimens, including a sample from 1829. Curator Jordan Metzgar gave a demonstration of plant pressing techniques for the crowd. Our Specimen Selfie Station was popular! People were particularly impressed by the beauty of this yellow lady slipper specimen. Thanks to Dr. Brenda Winkel, Gloria Schoenholtz, and Lindsay Key for photos! More images are on our facebook post. Figure legend: Transfers of specimens to the Massey Herbarium (maroon lines) and from the Massey Herbarium (orange lines) are shown. The top image shows a closer detail of transfers within North America. The bottom image shows global transfers. The lines are unweighted, so a single line can represent from 1 to 14 transfers. The Massey Herbarium is referred to as a regional herbarium. Our size (115,000 specimens) means that our collections are centered on Virginia and the southeastern USA. Larger herbaria (millions of specimens) can have global representation in their collections. 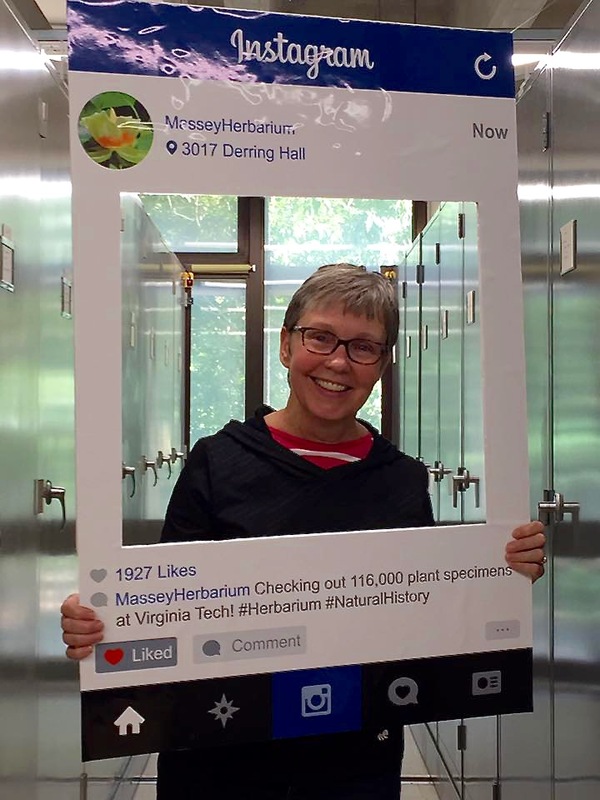 This doesn't mean the Massey Herbarium doesn't pull its weight globally! I looked at our specimen transfers over the last twenty years. These transfers include instances when we participated in loans or exchanges with other institutions. We have worked with herbaria, museums, universities, and research centers on five continents and 12 countries! Our publication record is even more impressive, but that will wait for a future blog post! Today I visited the Teaching Plant Collection in the Biological Sciences Greenhouse. It was wonderful being surrounded by fruiting papaya trees, towering Amorphophallus leaves, millions of maidenhair ferns, and other wonders! One of my favorites was this blooming cacao tree (Theobroma cacao). Yes, the chocolate tree! This species is cauliflorous, meaning the flowers sprout directly from the stem. This is a rare sight in western Virginia. The eastern redbud (Cercis canadensis) is one of the few local examples of this phenomenon. Before you get too hungry, know that any fruits will take months to mature. You would then have to remove the seeds from the fruits and process them by fermentation, drying, roasting, and grinding to produce chocolate! Today I have been looking at illustrations in the Flora of Virginia and discovered that some of these illustrations were prepared using Massey Herbarium specimens. Lara Call Gastinger made this line drawing of American basswood (Tilia americana) using a loan of our material! If you have the Flora of Virginia, you can check out the Ilex collina, Juglans nigra, Juglans cinerea, and Sanicula smallii illustrations to see more Massey Herbarium art!